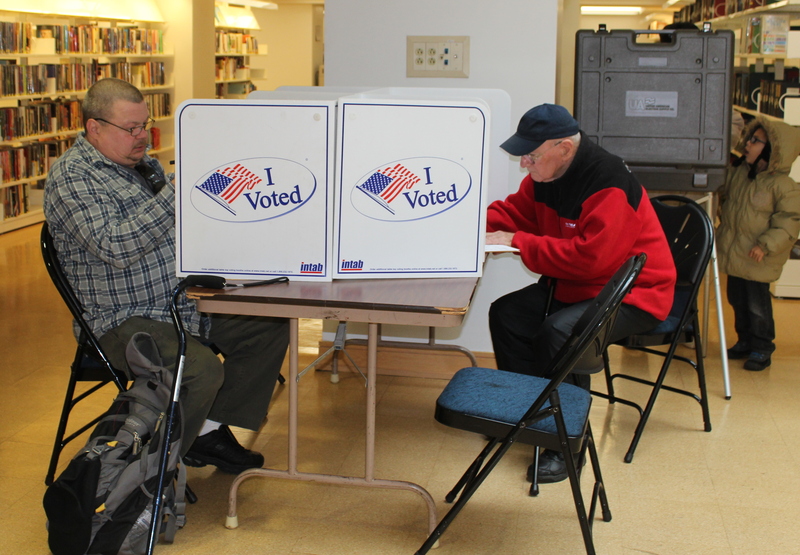 Casting ballots at the Hartford Public Library last November. Connecticut followed a national trend with a boost in the number of voters who cast ballots in their party’s primary election on Tuesday, and those numbers show that enthusiasm among Democratic voters has increased. According to the latest, but still unofficial, figures from the Secretary of State’s office, nearly 29 percent, or 215,781, Democrats cast votes in Tuesday’s elections. Nearly 32 percent, or 135,961, Republicans voted that day. Although a greater percentage of Republicans than Democrats voted in Tuesday’s primary, Democrats were able to narrow Connecticut’s traditional gap in voter turnout between the parties, which historically has favored Republicans. “The Democratic Party is pretty energized heading into the mid-term elections and I think it has to do with Trump,” said Gary Rose, head of the political science department at Sacred Heart University. In 2014, the Republican primary turnout was 20 percent. There was no Democratic statewide primary race that year. In 2012, the Republican turnout was nearly 28 percent, while the Democratic turnout was a little more than 19 percent. In 2010, the Republican turnout was nearly 30 percent and the Democratic turnout nearly 25 percent. In recent history, only the 2006 primary race between Democrats Ned Lamont and Joe Lieberman for the U.S. Senate attracted a greater percentage of primary voters, nearly 43 percent. Lamont won the nomination, but Lieberman switched his party affiliation to run as an independent candidate and won the general election. Three other states also had primaries on Tuesday — Vermont, Minnesota and Wisconsin. They all had a surge in primary voters, especially among Democrats. Lamont won the Democratic nomination for governor and Susan Bysiewicz was favored in the Democrat’s contest for lieutenant governor. Rose believes any increased enthusiasm among Democratic voters in Connecticut is a result of opposition to President Donald Trump. “It’s not for love of Ned Lamont,” he said. Rose also predicted a “pretty high turnout” of Democrats in November’s general election. On the Republican side, turnout was driven by the number of GOP gubernatorial candidates – five. Bob Stefanowski won that five-way contest. Connecticut Secretary of the State Denise Merrill said turnout was fueled by an increase in voter registration for both the Republican and Democratic parties, an indication Connecticut voters are more politically involved this year. “But turnout varied widely by town,” Merrill said. In Hartford, for example, turnout for both the Democratic and Republican primaries was little less than 20 percent. The surge of primary voters in Connecticut follows a national trend. That enthusiasm is especially evident in primary races for the U.S. House of Representatives. But in the only U.S. House primary races in Connecticut, the contest between Democrats Jahana Hayes and Mary Glassman and among Republicans Manny Santos, Ruby Corby O’Neill and Rich DuPont, that was not the case. There were 39,652 votes cast in the Hayes-Glassman race and nearly as many, 32,098, for the Republican contest. Rose said the heavy interest by Republicans in the governor’s race is likely to have helped boost the number of votes cast in the GOP 5th District primary, which had attracted much less attention than the Democratic primary. Hayes won the Democratic nomination and Santos is the Republican candidate going into the general election.